The term superstar has origins that go back to a cricket sportswriter's description in 1832. A superstar is someone whose celebrity has transcended his or her profession to widespread public awareness. As if there was ever any doubt, Tiger Woods is a true superstar. Most sports victories make headlines on sports site and pages. Big ones might grace the front page if its a home team or hero. A superstar's big win makes the front page everywhere. Dude won after trailing for the first 54 holes. In Jul 2018, he was in the conversation at the British Open. What's more, Woods has gone back to his original basics, re-creating the swing that forced courses to Tiger-proof them. It seems he's rediscovered himself in the process, too. Jack Nicklaus won his last major at the impressive age of 46. Tiger's 43. 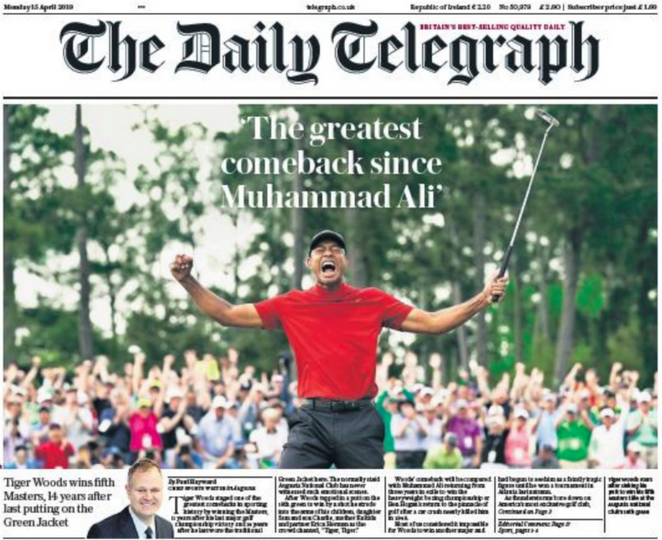 This win at Augusta and the relentless route he took to achieve it will put him back in the conversation for other major titles in the near future. Bovada's already installed him as the PGA Championship favorite in June. Dude opened a 8:1. Clearly, he's bankable again. This time around, though, it doesn't seem like that's as high a priority as it once was. Tiger's kids finally got to see in person what they'd only known of his career on YouTube. In a family pride sorta way, that's progress, too.